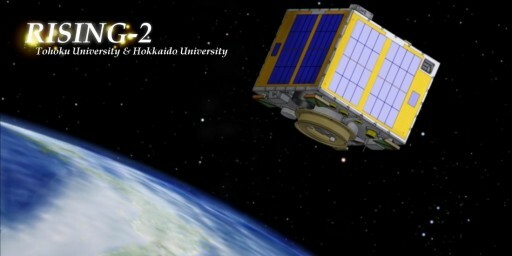 Rising-2 is a microsatellite project of Tohoku University and Hokkaido University, Japan, to create an Earth observation satellite with a resolution of 5 meters for the study of cumulonimbus clouds and upper atmospheric lightning (Transient Luminous Events). 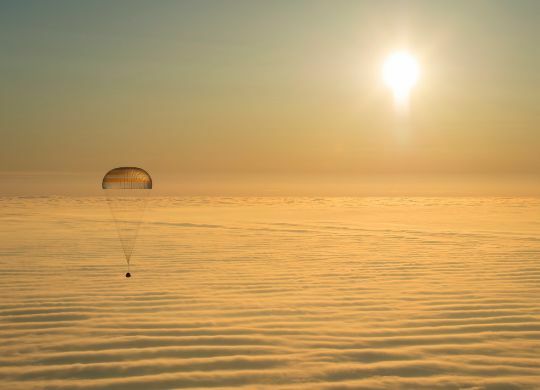 The project was initiated in 2009 building on the Rising-1 spacecraft that was launched that year and allowed Rising-2 to inherit some of its bus and payload features. The cubical Rising-2 spacecraft has a side length of 50 centimeters and weighs 42 Kilograms featuring a central load-bearing pillar using 3mm aluminum alloy. The side panels are also aluminum structures (10mm structural ribs & 1.5mm skin) that allow equipment to be mounted on their inside and solar arrays to be installed on the side panels of the spacecraft. 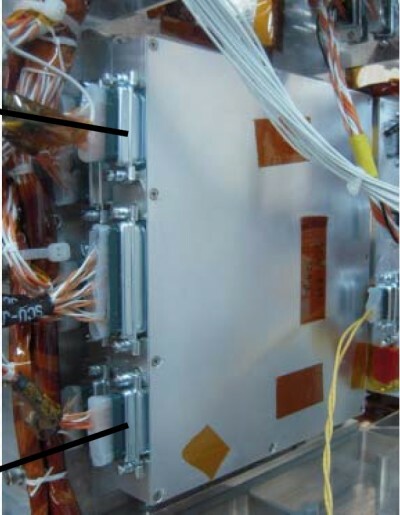 Rising-2 uses body-mounted Gallium-Arsenide solar cells for power generation – each side panel features four strings of eight cells plus two strings of eight cells on the top side of the spacecraft. The spacecraft generates about 42 Watts of power that is stored in a nine-cell NiMH battery with a capacity of 3.7 amp-hours. Avionics installed on the satellite regulate power distribution and battery charge/discharge. Rising-2 employs peak power tracking to generate the maximum possible power for the current illumination situation on the solar panels. Overall, the satellite requires 28.5 Watts of power during imaging operations while its standby power is about 8 Watts. The Rising-2 satellite is three-axis stabilized using star trackers, sun sensors, a magnetometer and gyros for precise attitude determination and a reaction wheel assembly for satellite pointing with three magnetic torquers for momentum dumps and control during spacecraft safe modes. The two High-precision Star Sensors each have a field of view of 22 degrees and use a pyramid star identification algorithm to acquire known star patterns and track them for attitude determination. The reaction Wheels of the satellite spin at 4500rpm and are capable of reaching a maximum torque of 3.3mNm and a maximum angular momentum of 0.047Nms at a power consumption of up to 12 Watts. The satellite achieves a pointing accuracy better than 0.1 degrees using a fine pointing mode that is active for observations of targets on Earth – 15 minutes in the sunlit orbit portion and 15 minutes during orbital night. The mode utilizes the reaction wheels and star trackers. In its coarse pointing mode, Rising-2 deactivates most of its ADC system for power saving purposes – using only its magnetic torquers for attitude actuation and the magnetometer and its solar panels as coarse sun sensors to determine Earth and sun-direction for basic pointing that ensures good power generation. The coarse pointing mode is controlled by the Spacecraft Control Unit while the Accurate Attitude Control System includes a dedicated Attitude Control Unit for the actuation of the Reaction Wheels the control of the three-axis gyro, two star trackers and four sun-angle sensors. Three-axis attitude is computed using star tracker data while vehicle rates are determined via the gyro unit. 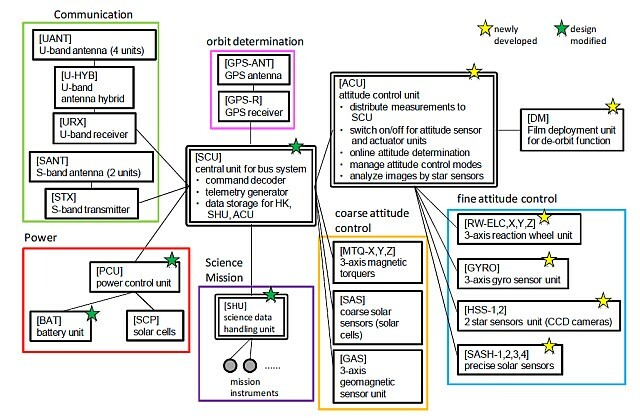 The Spacecraft Control Unit commands the Attitude Control Unit to move the spacecraft to its observation attitude as commanded by the ground while the ACU sends telemetry to the SCU for housekeeping data downlink. 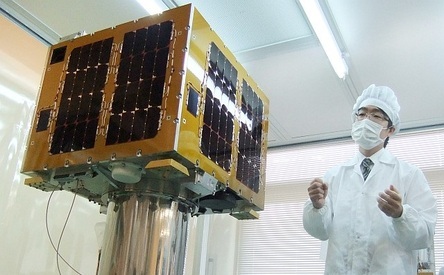 Rising-2 employs a data system consisting of a central Spacecraft Control Unit that interfaces with the communications system and all other control equipment to regulate all functions of the spacecraft. The SCU consists of two Field Programmable Gate Arrays, a Central Processing Unit and data interfaces. Connected to the SCU are the Attitude Control Unit, the Science Handling Unit and the Power Control Unit as well as a series of peripheral systems such as the S-Band communications terminal, a UHF receiver, and the GPS receiver. The Science Handling Unit interfaces with the different instruments of the satellite and commands the science equipment and collects acquired science data for storage and for transfer to the SCU and subsequent downlink to the ground. The SCU includes 128MB of Flash memory for science data storage, 4 x 8MB of SRAM and 2 x 128 KB of EEPROM for its boot software. The Power Control Unit is in charge of peak power tracking, power distribution and battery charge & discharge. Data downlink from the satellite is accomplished in S-Band with a data rate of 38.4kbit/s while uplink uses the UHF terminal of the satellite at a data rate of 1.2kbit/s. Downlink stations at Tohoku University, Japan, Kiruna, Sweden and in Thailand are used to downlink acquired science data. Uplink is done at Tohoku only. 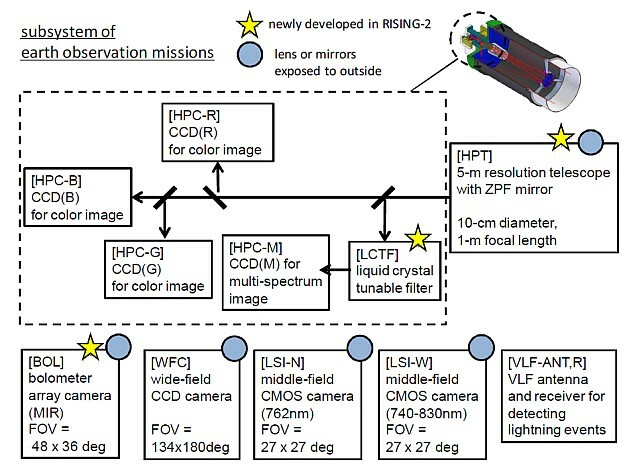 Rising-2 carries a complement of five scientific payloads – the High Precision Telescope, two Lightning & Sprite Imagers, a Wide-Field Camera, a Very Low Frequency Receiver and a Bolometer Array Camera. 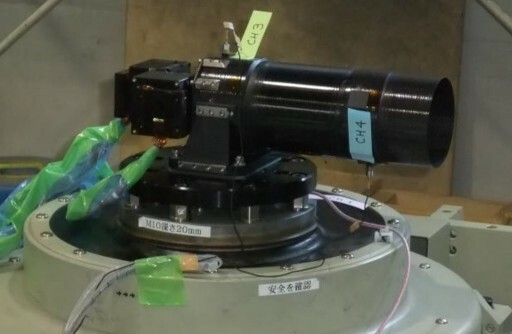 The primary instrument of Rising-2 is the High Precision Telescope that is used for Earth Observations and the observation of Transient Luminous Events. The instrument is a Cassegrain-telescope using a primary concave mirror and a secondary convex mirror aligned about the optical axis. 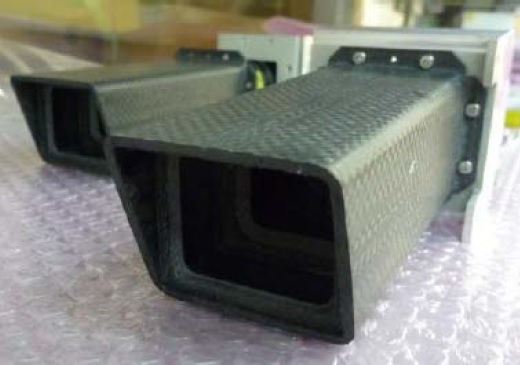 The mirrors use Zero-expansion, pore-free ceramics of Nihon that have low-mass and high-strength characteristics and a very high thermal stability. The telescope has an aperture diameter of 100 millimeters and a focal length of 1,000mm. 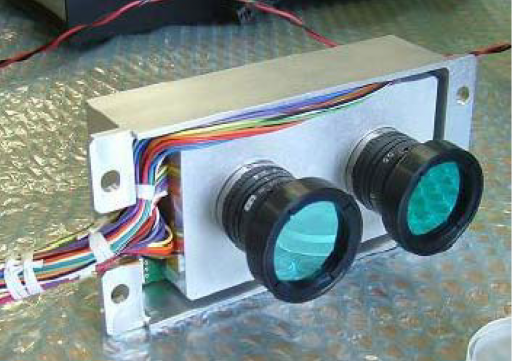 HPT uses a CCD detector array featuring four detectors for RGB observations at wavelengths of 400 to 650nm and observations at 650 to 1,000nm using a Liquid Crystal Tunable Filter detection technique. The LCTF is polarization sensitive and allows the measurement of the properties of solar radiation reflected from surfaces on Earth. On command, the LCTF can be tuned to any desired wavelength within its spectral range. The telescope has a field of view of 0.27 by 0.2 degrees corresponding to 3.3 by 2.5 Kilometers on the ground. The instrument achieves a ground resolution of 5 meters for RGB images. The LCTF achieves a spatial resolution of 5 to 50 meters with a filter step size of 1nm. The instrument is operated at an exposure time of 1/4000 seconds in RGB mode. The Bolometer Array Instrument is an uncooled infrared imager covering a spectral range of 8 to 14 micrometers (thermal infrared). Each pixel on the array consists of several layers including an infrared absorbing material and a reflector underneath it that directs IR radiation that passes through the absorber back to the absorbing layer to ensure a near complete absorption. 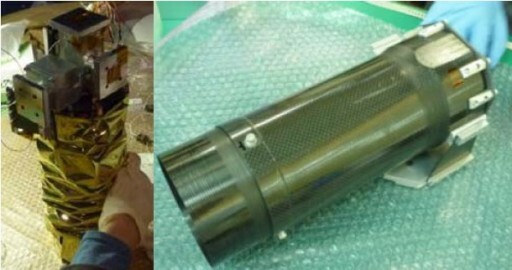 As IR radiation strikes the detector, the absorbing material is heated and changes its electrical resistance which can be measured via electrodes connected to each microbolometer and processed into an intensity read-out. The Bolometer Array Instrument has a mass of 0.55 Kilograms and requires 8.5 Watts of power. It has a field of view of 48 by 36 degrees and achieves a ground resolution of about 900 meters. The instrument requires regular calibration by acquiring images of deep space as a cold target reference. The Bolometer Array is used to acquire images of cumulonimbus cloud regions, ground surfaces and maritime areas for a variety of purposes. Imagery provided by the instrument can be used to determine the temperature of the top region of cumulonimbus from which the altitude of the clouds can be deduced. With simultaneous observations using the other instruments of the spacecraft, this data will help provide insight into the relationship between transient luminous events and cumulonimbus. Furthermore, the bolometer will be used to acquire ground images to determine the temperature profile of the land and sea surface. Monitoring wildfires and volcanic activity is also provided by BOL with a rapid capability to survey regions of interest with HPT to provide high-resolution images for response efforts to fires or other disasters. Rising-2 is equipped with two Lightning and Sprite Imagers that feature identical detectors but are equipped with different passband filters. The two cameras will be used to detect Transient Luminous Events such as sprites and elves above thunderstorm clouds as well as lightning emissions at lower altitudes. 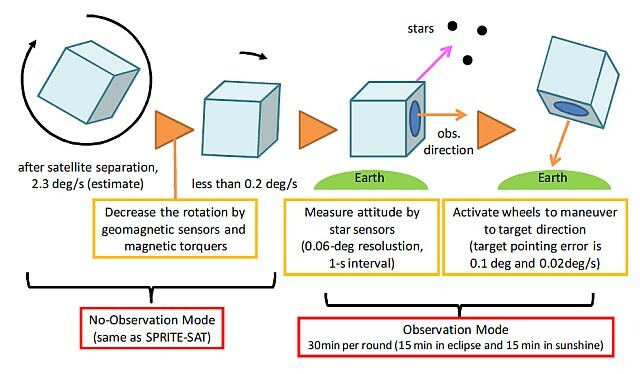 The two LSI cameras are facing nadir during imaging sessions to be able to acquire imagers of the horizontal distribution of lightning and sprite activity. 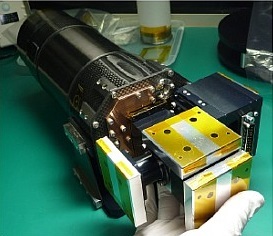 The two imagers use 512 by 512-pixel CMOS detectors creating a field of view of 29 by 29 degrees to allow the imagers to capture ground images of a swath of 342 Kilometers at a selectable spatial resolution of 2,400, 1,200 and 600 meters. The cameras operate with exposure times of 34.5ms. One of the imagers is equipped with a narrow bandpass filter at 762 nanometers while the other camera has a broad band pass of 765 to 830 nm. The narrow filter allows LSI-1 to acquire images of high-altitude Transient Luminous emissions without detecting emissions from lower altitudes while LSI-2 detects low-altitude lightning as well as high-altitude TLE. 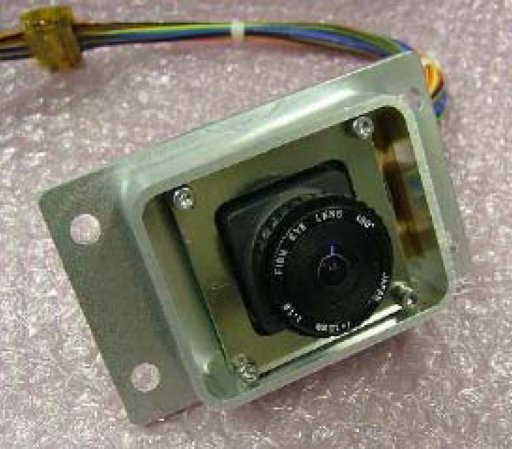 The Rising-2 Wide Field Camera has a field of view of 180 by 134 degrees carrying a high-sensitivity panchromatic CCD detector with a fish-eye lens. The 223-gram camera will be used to detect the location of lightning flashes and Terrestrial Gamma-ray flash events. Overall, WFC achieves a ground resolution of 6.7 Kilometers using exposure times of 16.7ms. A Very Low Frequency Receiver VLFR is installed on the satellite to record the low-frequency signatures of lightning events. Using its five instruments, Rising-2 operates in seven different observation mode – for 15 minutes in the night portion of every orbit and 15 minutes during each orbital day. During night, the satellite can operate in sprite observation mode using the LSI and VLFR instruments, the lightning observation mode only uses WFR and VLFR while the pure LSI only mode is used for cumulonimbus, ground, and sea observations during day passes and the WFR only mode acquires aurora, ground, and sea imagery. The Bolometer is active during cumulonimbus, ground, and sea observation sessions while the HPT instrument can be used to observe cumulonimbus, ground, moon, and planets.